Uber is proof that new technology and innovative thinking can take an entire industry by storm. Obviously they aren’t the only ride-sharing company but they certainly are the largest. Launching in 2009, they are currently valued at over $50 billion. It’s an amazing company that created an infrastructure of millions of drivers in metropolitan cities around the world. It should come as no surprise that Uber decided to utilize this network in other areas and now they have with UberEATS. Delivery drivers for food is nothing new. It’s almost hard to imagine eating a pizza without having it brought to my home, to the studio on a photo shoot, or during a meeting with fellow photographers. For my wife, it’s Chinese food…The driver for our local Chinese restaurant knows us so well that every time he drops off our General Tso’s Chicken, he remembers the names of our dogs. Taking it another step further, there are other third party food delivery services who can bring you meals from restaurants who don’t have food delivery themselves. It’s a great concept and proof that entrepreneurial ideas can really create success stories. Companies like Postmakes, Grubhub, Caviar, and others have been doing 3rd party food delivery for a while now in larger cities. The biggest problem all of them have though is having a network of drivers in areas that can pick up the food and get it to the customer in a timely manner. It’s always been this inustry’s Achilles heel. Whenever I order pizza, I always ask for a weird request. 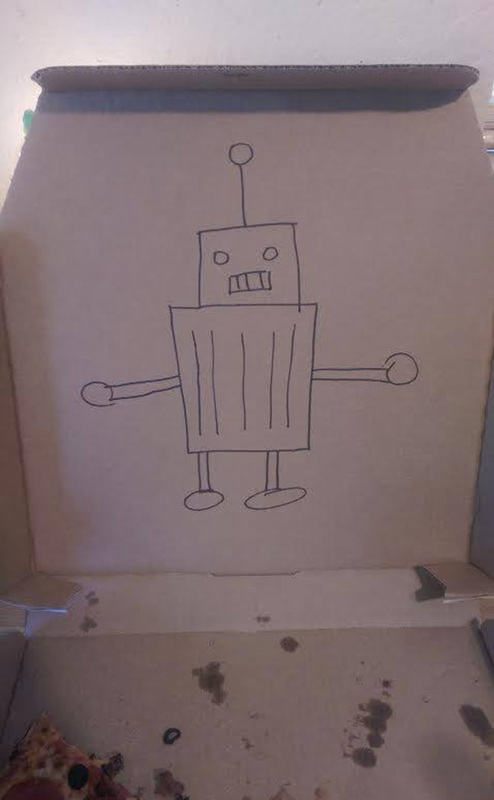 In this case I asked the delivery driver to draw a robot on the box. If they do…extra tip! UberEATS solves that problem. Their massive system of drivers and their already well-designed phone app made food delivery a no brainer concept for them. Living in Las Vegas, I had never heard of UberEATS upon their initial launch because they were only starting with a handful of cities. 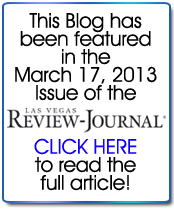 As they started to expand into new areas, Las Vegas made the list. 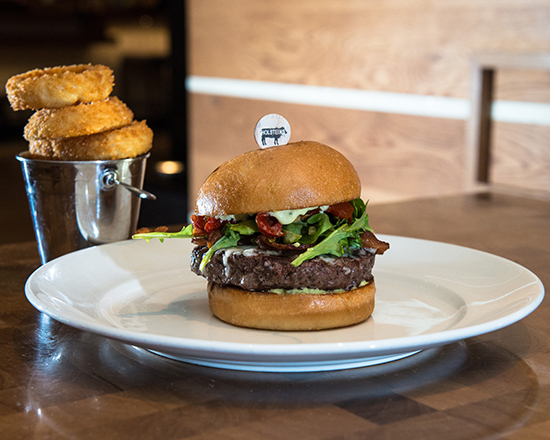 It made perfect sense too, as Las Vegas has a huge variety of restaurants ranging from family owned bistros to chain restaurants, fine dining restaurants with the “old Vegas” feel up to high-energy restaurants with celebrity chefs, and everything in between. My wife and I love eating out and experimenting with new restaurants and I’m lucky that most of my friends do too. Before UberEATS launches into a new city, they want to have a huge menu of restaurants (no pun intended) already loaded in the app. 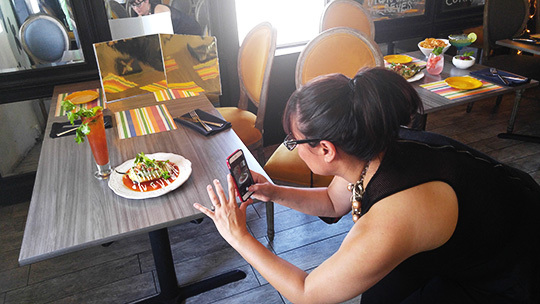 As such, they needed photographers to shoot food for a LOT of restaurants prior to them going online. 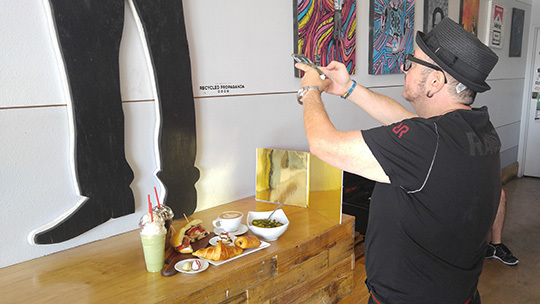 That’s where I come in…I was contracted to be one of the few local photographers in Las Vegas to work with local restaurants in their network to capture great looking food photos to represent them in the UberEATS app. 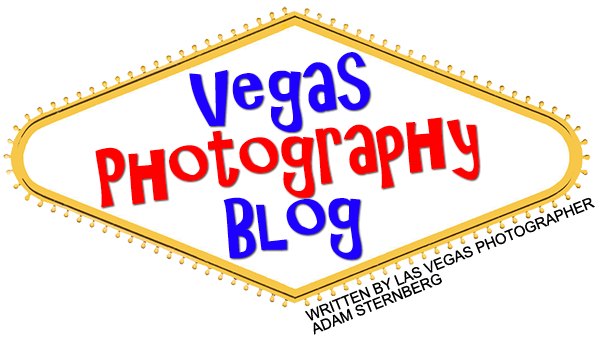 I was excited to get this contract for several reasons; first, because I love the creativity that you can add to food photo shoots, but second, because I knew I would be introduced to restaurants all over Las Vegas for the first time. Best of all, I was getting paid for this…it was a win/win/win! 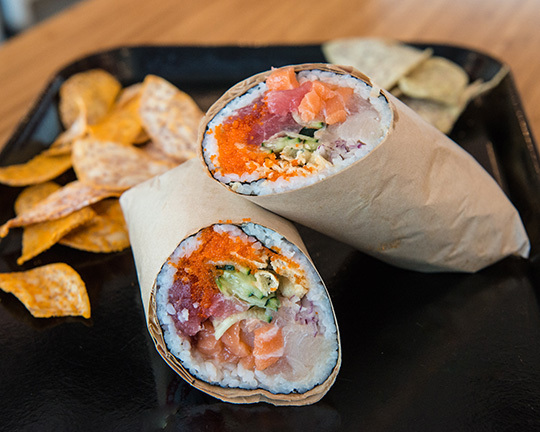 Photo I shot for Soho Sushi Burrito…an innovative new food concept to hit Las Vegas. 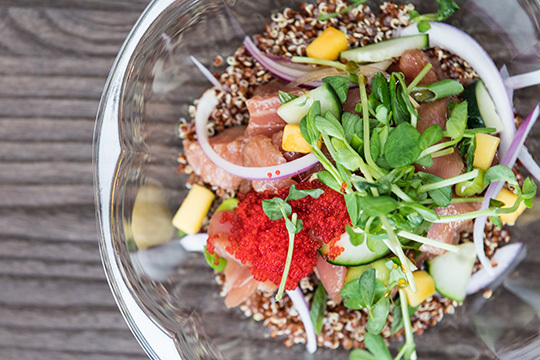 UberEATS’ goal was to photograph 100 restaurants in 30 days between three photographers. It was an ambitious venture, no doubt. As I’m writing this, I was a bit curious how many I actually shot for them in that first month and I was amazed to discover my count was 48. All my friends and family pretty much never saw me for the month of August of this year. Because we had so many different restaurants to shoot, the staff at UberEATS gave me a pretty organized schedule, keeping me shooting an average of 3-4 restaurants a day in geographically close locations. The only downside was that they needed the photos immediately after I shot them, so I had to rush home that night and do all the post-processing on the images within hours after shooting them. Their requirements were that I only shoot 3-5 dishes and what we call in the industry, a “Hero Shot”, meaning a masthead image that they will use to represent the restaurant as a whole. The shoots themselves were generally very quick. Unlike many of my other food shoots I do for restaurant menus, billboards, etc., I had little time to actually prep or light the dishes. These weren’t complex photo shoots where lots of staging could be done to make the items look perfect, so instead I had to do the best I could in a very short amount of time with minimal lighting effects at my disposal. Once in a while I could setup lights in the restaurant to get a desired effect, like I did with this shoot I did for Holsteins’s inside the Cosmopolitan Hotel, but most of the time I was using natural light with a reflector or two on the table using very low-tech methods to get the desired effect. 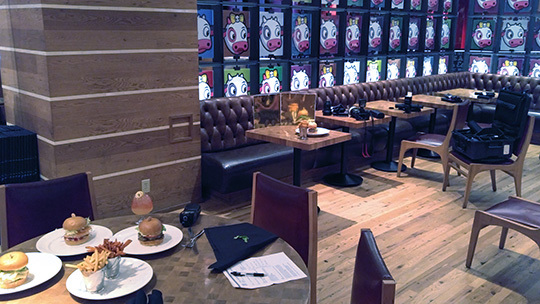 Behind-the-scenes of my shoot at Holsteins Shakes & Buns inside the Cosmopolitan Hotel. I had no natural light to work with so I had to setup a series of lights and reflectors around the room to best capture their amazing burgers, shakes and side items. Here you can also see my staging area of the different items that needed to be photographed. One of my favorite photos from the Holsteins shoot. All their food looked amazing! 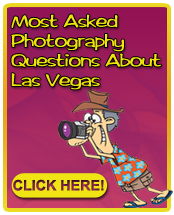 One thing I can say is that this assignment gave me a lifetime of education in a few weeks of shooting. I couldn’t rely on the ability to take a lot of time to do these shoots, so I had to provide high quality photos in a very short amount of time. 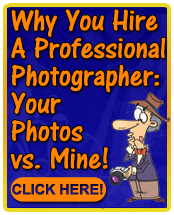 My average amount of time I would spend shooting an entire restaurant was less than 45 minutes. On my normal food shoots, I could easily spend that much time (or more) shooting just one dish. 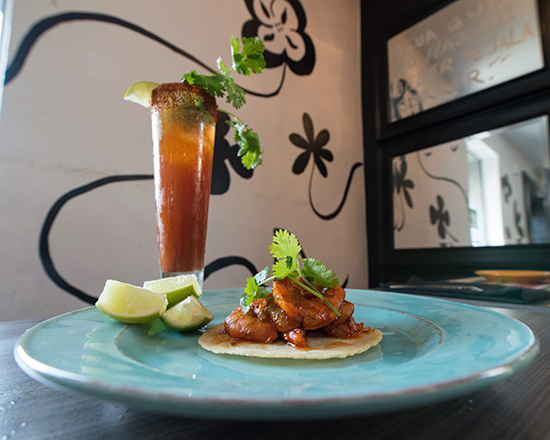 Behind-the-scenes at El Sombrero Mexican Bistro. One of the most amazing restaurants in Las Vegas, they have been a fixture of downtown since 1950. The owner truly understands the importance of visually interesting food and it shows! The Shrimp Diablo Taco at El Sombrero Mexican Bistro. They were nice enough to let me sample this dish after the shoot and it was by far the best taco I’ve ever had and these guys take Mexican food to a whole new level! 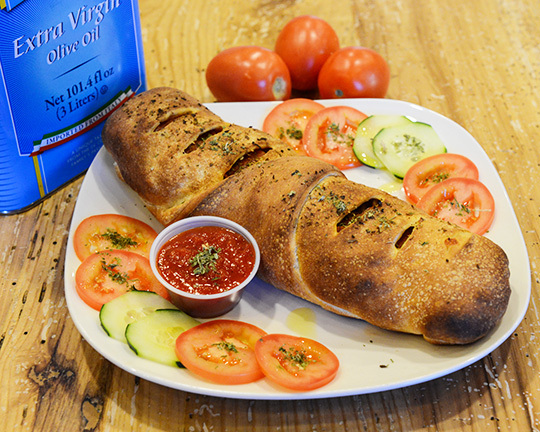 Nothing beats a great stromboli! Aside from the crazy shooting schedule, the immediate retouching needs that were required, and the many miles of driving from one restaurant to another, this has been a really awesome project to be involved with. 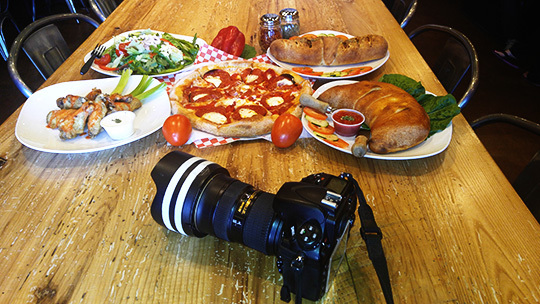 Shooting food is a lot of fun and granted, there are only so many ways you can photograph a pizza to make it look better than the last pizza you shot, the variety of restaurants I worked with was fantastic. I remember one day I shot lox and bagels at the Bagel Café, Shrimp Pad Thai at Ocha Cuisine, Pesto Turkey Sandwiches at PublicUS, frozen smoothies at Pineapple Park, and wrapped it all up shooting sushi wraps at SoHo Sushi Burrito. Behind-the-scenes with the owner of Madhouse Coffee. Sometimes you have to get creative on where you stage things for these shoots inside of busy restaurants. Here, we decided to shoot on a bench instead of a table as it made for an easy place to shoot and also provided a nice look as well. These guys love to make food visual. 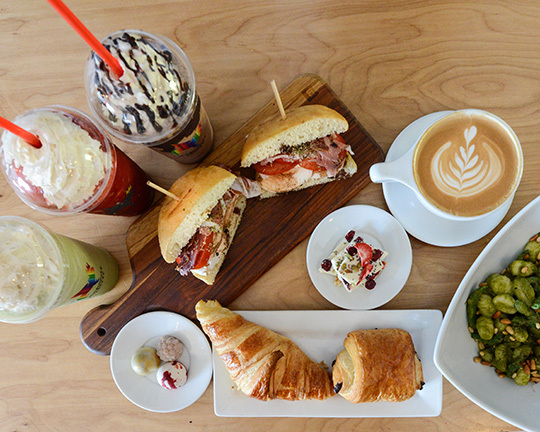 Everything from their drinks to their sandwiches and especially their chocolates…all look too beautiful to eat! Behind-the-scenes with some of the team at Tbaar. 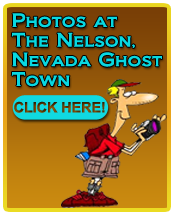 This hidden gem on Las Vegas Blvd. 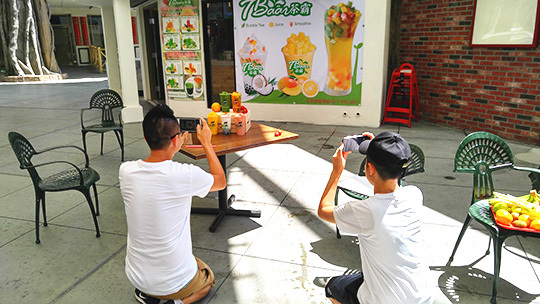 makes all their smoothies with fresh fruit, which really helps to make for some great photos! 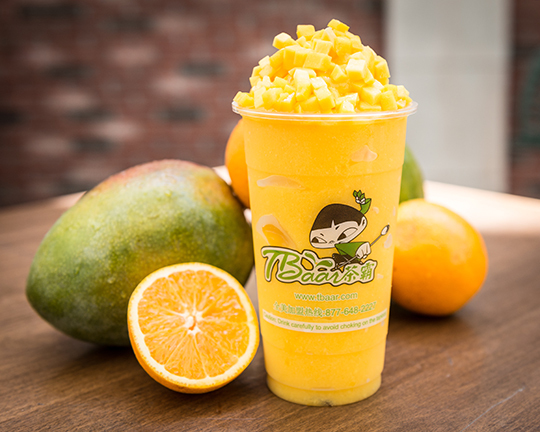 Mango Orange Smoothie at Tbaar. 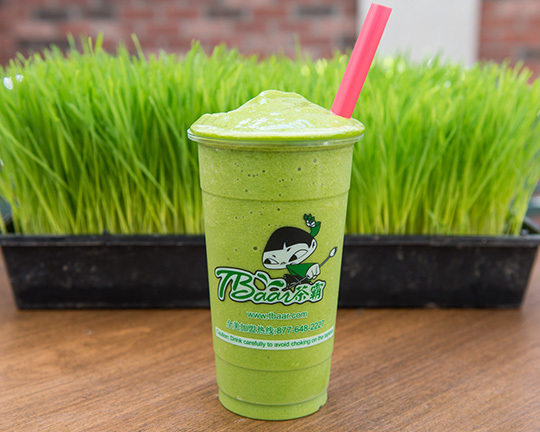 It’s not easy being green, but is sure can photograph well at Tbaar! Of course one of the benefits of all this networking is occasionally some restaurants call me back and book me to do more shoots for them. 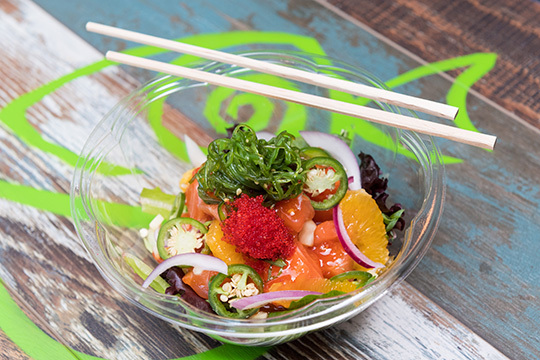 One such client is Soulfish Poke, who now has several restaurants around Las Vegas. 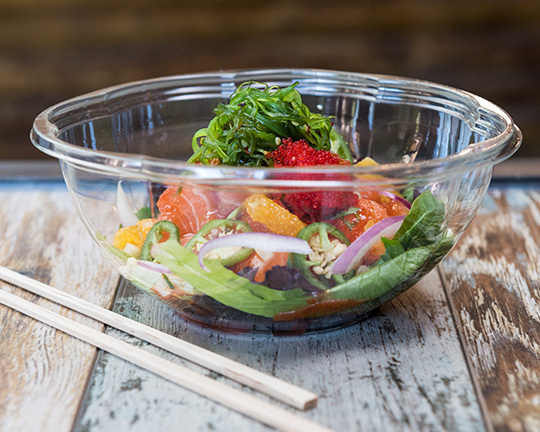 Not only does their food taste incredible but their chefs put in a huge amount of effort to make their bowls look amazing too. As someone who works in the visual arts I can appreciate that how your meal is presented can be just as important as how it tastes and these guys do a great job at both! 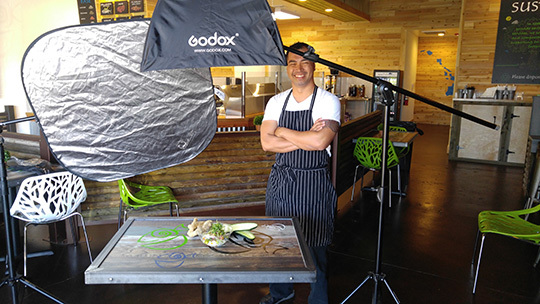 Behind the scene with the chef at Soulfish Poke. As this was a contracted shoot from the restaurant, I was able to spend a bit more time in the staging and lighting for these items. Quality staging, lighting, and composition makes a huge difference in food photography! One of my favorite photos from the Soulfish Poke shoot. We had a lot of fun staging this one! So, if you haven’t loaded UberEATS on your phone yet, I highly encourage you to do so. Their drivers can get food to you super-fast and I can attest that for the majority of restaurants I worked with, the food tastes as good as it looks. Special thanks to UberEATS and the cooperation of all the restaurants I have worked with over the last three months in their amazing food preparations, wonderful staff, and making the process of photographing their signature dishes such a pleasant experience! 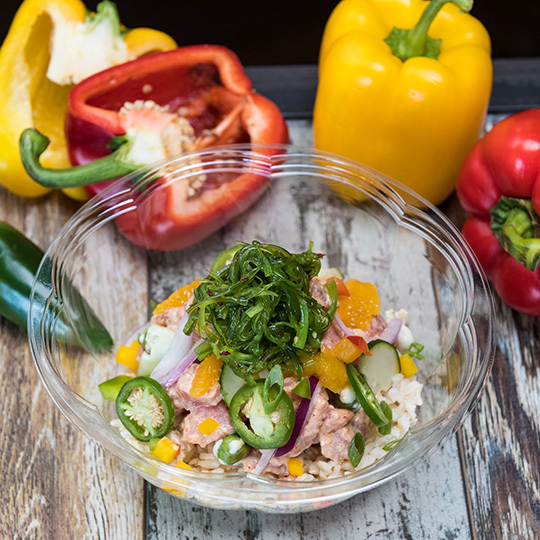 If you are a a restaurant, catering company, private chef, or mobile food truck and want to get some amazing photos of your food items, please give me a call today to get you the high-quality photos you are looking for. We can do food shoots for your menus, menu boards, social media, website, marketing materials, and more! Your food photos look incredible. Now I’m sooooooo hungry!!! !